Known to be one of the world's greatest songwriters, Paul McCartney will now try his hand at authoring a children's book that will arrive next year. 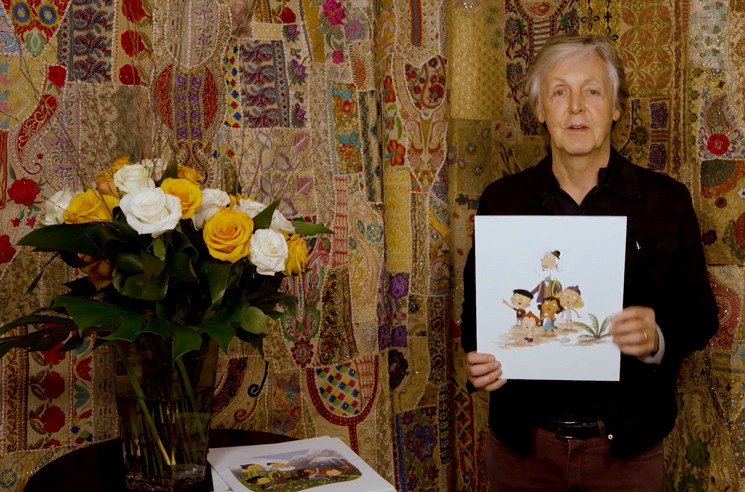 McCartney has announced that he'll publish a picture book titled Hey Grandude! through Puffin in September 2019. The book is "lovingly inspired by his experiences as a grandfather," and features illustrations by Toronto-based artist Kathryn Durst. "I've got eight grandchildren and they're all beautiful," McCartney said in an announcement video. "One day one of them said to me 'Hey Grandude!' I said 'What?' and I thought, 'I kind of like that,' so from then on I was kind of known as Grandude. "So I thought, you know what, it's actually a nice idea for a book, so I started to write some stories, and then I talked to the book publishers and they liked what I was doing." Of the plot, McCartney said that book is "about a character called Grandude who represents grandfathers everywhere. He has four grandchildren and he calls them 'Chillers.' They love him and they go on adventures with him and he's kind of magical, so you'll see that in the book." Hey Grandude! is available for preorder here. McCartney recently released his Egypt Station LP.